I’m sure every cook has a recipe for Oriental Cole Slaw in their repertoire. Each one is slightly different, however. Some are heavy on the oil and light on the vinegar. Some use 1/4 cup of sugar (or more) while others just a couple of tablespoons. This is the only recipe we used, however. 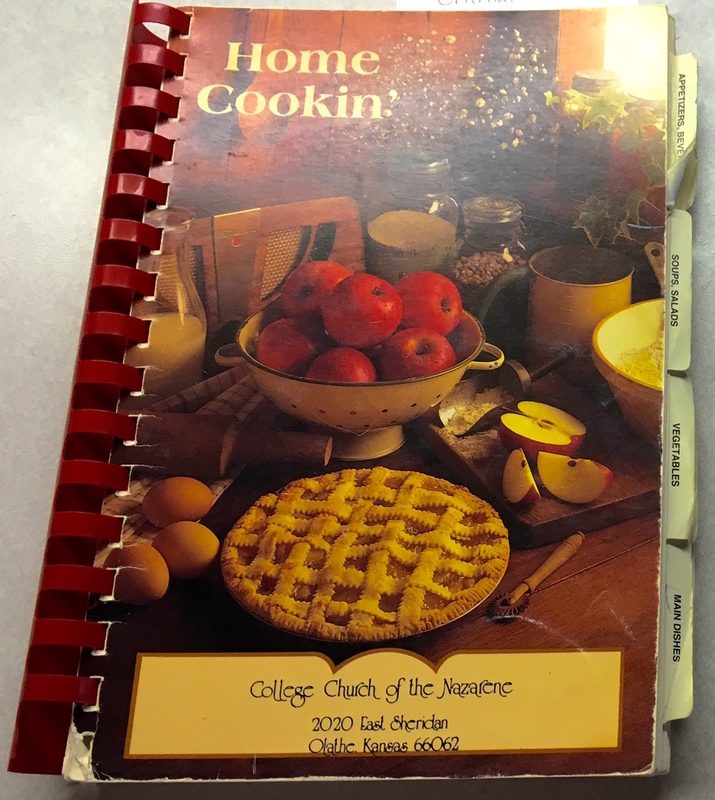 It appeared in our church cookbook from the mid 1990s, and we’ve enjoyed it as a tasty summer side dish ever since. As I recall, the adults enjoyed the recipe more than the kids, but now that the children are grown up, perhaps their tastes have changed. Here is the recipe, in case they choose to try it sometime… and here is a tribute to our family church. Brown almonds and sesame seeds under the broiler. Let cool. 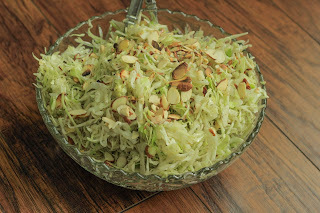 Mix almonds and seeds with cabbage and green onion. Break up ramen noodles into small pieces (I find doing this in a quart-size plastic bag is less painful than doing it with my bare hands). Mix together the dressing ingredients and pour over the slaw. Toss together and serve. This slaw is best served within a few hours of preparation. Otherwise, the ramen noodles tend to become soggy. I've never seen or ate a cabbage slaw with ramen noodles. It sounds/looks good so I'm pinning it. Slaw is one of those things that I hated as a child but as I've gotten older I've come to really like it. I love the different textures in this recipe! And that dressing sounds like it would be perfectly sweet and tangy. Oh I like the idea of almonds in this salad. Cabbage is plentiful at the farmers market these days, so slaw is a great choice. I'm one of those who does not have a family coleslaw recipe, but I love the sound of yours. It intrigues me enough to put these items on my grocery list and give it a try. It is a good dressing, Katherine! The sugar can be adjusted to taste. Gloppy – GREAT word! I much prefer a oil based dressing to one that is mayonnaise based. I'd love to hear how you like it, Margot! 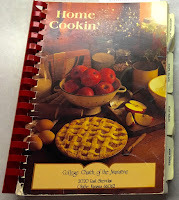 I wonder if this is a regional recipe(?) I'm in the midwest but I do not remember having it when I leaved on the east coast. I want to try that slaw with the noodles, and that combination of ingredients. It does sound good. Asian-flavored slaw has a lot of possibility, doesn't it? Your go-to recipe sounds interesting. I had some from the Whole Foods prepared food selection recently that was just cabbage, bell pepper, and oil and vinegar dressing with Asian flavors — pretty good. I also made some in my temporary and minimally equipped kitchen using a bottled ginger-soy dressing that's surprisingly good. Let me know how you like it, Claudia!